Concord Town Hall is located at 22 Monument Square, Concord MA 01742; phone: 978-318-3080. 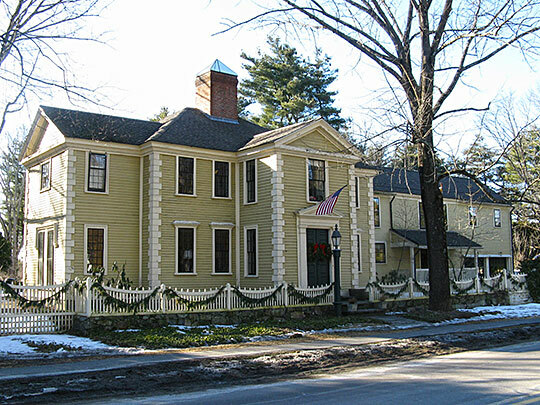 Photo: Thomas Hubbard House, Hubbard-French District, Sudbury Road, Concord, MA. The Hubbard-French District was listed on the National Register of Historic Places in 2000. Photographed by User:John Phelan (own work), 2010, [cc-by-3.0 (creativecommons.org/licenses/by/3.0)], via Wikimedia Commons, accessed May, 2013. Concord was incorporated in 1635. The town is often associated with the phrase, "the shot heard 'round' the world," being the site of the first battle fought in commencement of the Revolutionary War. In 1635, scarcely five years after Boston had been settled, Simon Willard, a fur trader, and the Reverend Peter Bulkeley led about a dozen families to this spot, then the Indian village of Musketaquid. It was the furthermost inland point in the wilderness. With garments, hatchets, knives, and cloth the settlers purchased from the Massachusetts tribe a plantation described as 'six myles of land square,' then clinched the bargain by smoking the pipe of peace with the Indian chieftains. The name 'Concord' commemorates this friendship, a friendship that was never broken. It went hard with the settlers during the first winters, but the settlement slowly grew, in the latter half of the century becoming a county seat. The first county convention to protest against the Acts of Parliament met here in August of 1774; the First Provincial Congress in October of the same year. From March 22 until four days before the Battle at the Bridge, the Second Provincial Congress held sessions in the town. During the siege of Boston that followed, so many patriots took refuge in Concord that a Boston town meeting was called here. Again, while Harvard served as a barracks for American forces, the university classes were conducted in Concord. The town was the seat of the Middlesex field of Shays's Rebellion. Following a post-war period of readjustment, Concord entered upon its second phase this time as an important center of American culture. Here Ralph Waldo Emerson wrote his greatest essays, poems, and journals, and revived the philosophy of Transcendentalism. Closely associated with the Transcendentalist movement were Nathaniel Hawthorne, novelist; Franklin B. Sanborn, journalist, philanthropist, and biographer; and William Ellery Channing the poet. While not residents in Concord, Margaret Fuller, editor of the School of Philosophy's organ the Dial, and Elizabeth Fuller, Boston educator who established the first American kindergarten, were of this literary group. By the shores of Walden Pond, Emerson's intimate friend, Henry David Thoreau, the naturalist, fled from society, built his hut and studied the trees and birds he was to write about in 'Walden, or Life in the Woods.' In the building known as Hillside Chapel, Amos Bronson Alcott opened his School of Philosophy, while his more practical wife and daughters wrestled with the humdrum problem of making ends meet. As a result of their struggles, Mr. Alcott's daughter Louisa May wrote her series of books, the most autobiographical of which, 'Little Women,' has taken its place among children's classics. Margaret Sidney (Mrs. Harriet Mulford Stone Lothrop) was another Concord author, and Jane Austin wrote here the 'Nameless Nobleman.' Daniel Chester French (1850-1931) of Concord has won fame for his sculptures. These are represented in his home town by the Minuteman, the Melvin Memorial, and a statue of Emerson. Concord men have made contributions outside the field of the arts. Harrison Gray Dyer erected the first telegraph line in this country and William Monroe made the first lead pencils in America. In 1853 Ephraim Bull bred the Concord grape, a development which began the commercial production of table grapes in America.